Sarah Nader- snader@shawmedia.com Crystal Lake Central's Fred Birr pitches during the sixth inning of Saturday's baseball game against Crystal Lake South April 5, 2014. Crystal Lake Central won, 6-1. Sarah Nader- snader@shawmedia.com Crystal Lake South's Garrett Bright (left) waits for the ball while Crystal Lake Central's Luke Francis slides into second during the sixth inning of Saturday's baseball game in Crystal Lake April 5, 2014. Crystal Lake Central won, 6-1. 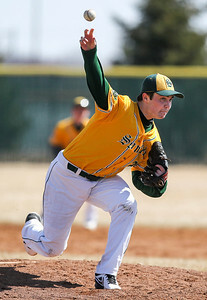 Sarah Nader- snader@shawmedia.com Crystal Lake South's Ryan Wilkening pitches during the sixth inning of Saturday's baseball game against Crystal Lake Central April 5, 2014. Crystal Lake Central won, 6-1. 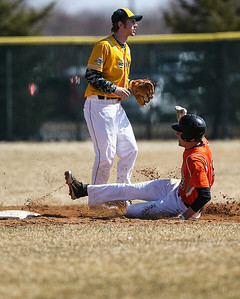 Sarah Nader- snader@shawmedia.com Crystal Lake South's Ryan Hetherington (left) slides back to first after trying to steal second while Crystal Lake Central's Luke Francis waits for the ball during the sixth inning of Saturday's baseball game in Crystal Lake Central April 5, 2014. Crystal Lake Central won, 6-1. 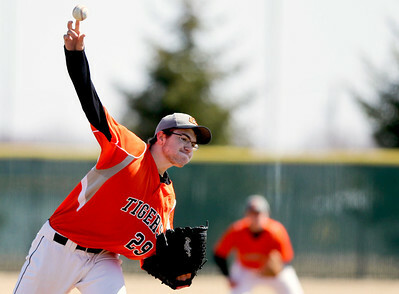 Crystal Lake Central's Fred Birr pitches during the sixth inning of Saturday's baseball game against Crystal Lake South April 5, 2014. 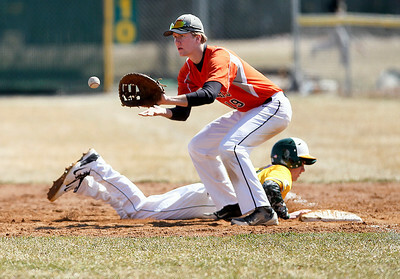 Crystal Lake Central won, 6-1.